There are many thrills you can get from being high above the ground, from skydiving to the "Mile High Club", which you were confused and mortified to discover has nothing to do with riding Six Flags' Acrophobia. 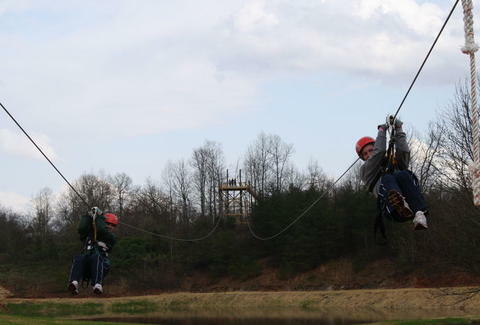 Get more intensely awesome air, at North Georgia Canopy Tours. Open to the public this Friday, Tours is a zip line journey through the treetops of God's Country (aka, Lula, GA), with up to three hours of aerial and land exploration covering 100 acres of trees 'n' trails, run by an environmentally astute couple who learned the business in Costa Rica, and've since nicknamed themselves "Captain" Kirk, and "Princess" Leah -- so yeah, they know how to party. Before getting up to 70 feet high, you'll get suited up with harnesses, helmets, and thick work gloves, then learn the basics of line-cruising and hand grips (slow-braking, emergency stops, pulling yourself to the landing if your zip's stuck in the middle...) on a smaller cord just a few feet off the ground, a concept you'll no doubt remember well from tightrope school. The real fun starts with the "Fly The Coop" zip, where you'll shoot away from the main grounds onto a wooden platform surrounded by a forest of hickory trees and ponds; from there, you'll land on low ground, stroll through the woods back to higher peaks, walk across 60+ feet high wood-paneled/rope-handled bridges, and continue with additional air-slides such as the tight-between-trees "Thriller", for which you'll use a very different, single glove. After your final zip (a 30+ MPH ride over a pond from a mega-tall observation deck), you'll reconvene to receive a certificate of completion, then hit a touch-screen kiosk to print out photos of the experience -- verifiable proof of your achievements, as opposed to the Six Flags photo you claim proves you got in the Mile High club by "Supermanning that h*e".